Whether you are considering getting into a franchise, or have made the commitment, Franchising Demystified provides you with a deep understanding of the franchisee-franchisor relationship. This definitive franchise handbook provides you with the tools to effectively assess the right franchise opportunity for you and then maximize your return on investment. Real-life examples let you learn from other people's mistakes and experiences. 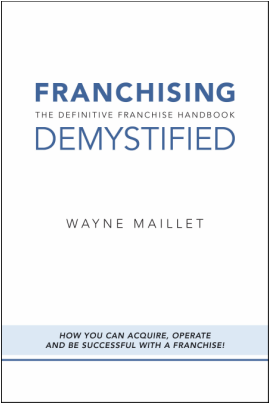 Franchising Demystified is a must read for anyone considering buying a franchise or currently a franchisee! Wayne Maillet is a leading franchise management consultant with over 25 years of practical experience in all aspects of franchise operations. Prior to consulting Wayne Maillet worked for the corporate office of such franchised companies as Keg Steakhouse, Uniglobe Travel and Realty World. Although the industries were different, the principles, challenges and opportunities of franchising were found to be the same. Mixing practical experience with an academic understanding, Wayne Maillet has spoken across Canada on how to franchise your business, lectured at Queens University, written several articles and is often quoted as an authority in franchising. Wayne Maillet's experience in franchising has extended across North America and includes involvement in operations, strategic planning, franchise sales and brand development. He has a great understanding of the needs of a company during the various distinct stages of franchise growth. Franchise Specialists is a full-service franchise development and management company founded by Wayne Maillet. Franchise Specialists can provides operational support to the franchisees and acts as a conduit for system franchisees to share best practices and facilitate growth through strategic planning, franchise recruitment, operations manuals and a wide range of business development services. Contact Wayne Maillet to learn more! Visit Franchise Specialists for professional franchise consulting.